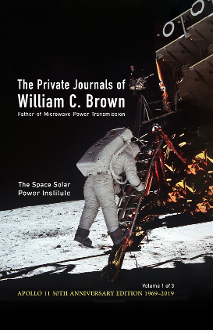 Join Bill Brown, one of the twentieth century's premier engineers, in this astonishing and intimate autobiography as he invents, demonstrates and pioneers practical Microwave Power Transmission(MPT). Bill’s rectenna provides Space Solar Power's key enabling technology, to continuously, gently and wirelessly beam terawatts of our sun's immense power from GEO to our groaning electric power grids. SSP can provide unlimited clean reliable energy to Earth, now 85% provided by fossil fuels. On this 50th anniversary of Apollo 11, volume one’s cover celebrates another of Bill’s 50+ landmark patents, his Amplitron, which provided television coverage from the Moon to the world of all the Apollo missions. Share Bill’s family, career and technical ups and downs with this gentle, soft-spoken man, tremendously respected by his peers, with a powerful vision and deep insight into what could be and the technical capability, courageous risk taking, and personal discipline to realize that goal.